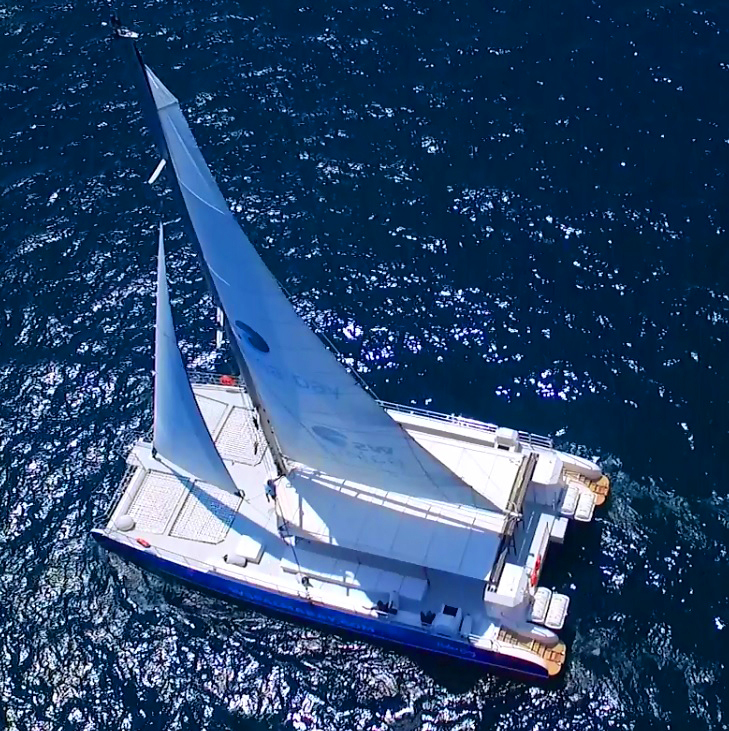 Home » News » New sailing catamaran of Dalmau Shipyard. For this project the shipyard has optimized all productive procedures and can have reality in less than 4 months. To achieve this objective, dalmau was make a detailed production planning and has been necessary a closed collaboration with all the suppliers and with competent authorities has been necessary. Since last 21th of June 21, only 4 working days after the delivery in Arenys de Mar, the boat is operating with passengers in the bay of Palma de Mallorca. In response to the concept requested by the ship-owner, the shipyard has designed a fully open sailing catamaran, with a flat deck, the mobility of passengers has been studied in detail, giving special importance to passengers with reduced mobility who travel in a wheelchair for guarantee the access to all areas of the main deck, as enabling a boarding bridge for and installing one adapted toilet. Modularity has been a key in the development of the project; different seating configurations have been proposed with the aim of adapt the boat quickly for the development of private events, parties with a dance floor, day charter, excursions, ... All of this keeping the number of seats according the rules for all passengers who participate in these activities. Drassanes Dalmau has specially attention to bow zone design, evolving the traditional concept of cross beam of the sailing catamarans through exhaustive structural analysis, achieving an innovator system of non-intrusive reinforcement that allows the union of stay in this area without straps or structures over the deck. With this the boat has a bow spectacular area where the passengers can enjoy the navigation in the three available balconies and can live unique sensations. Safety has received special attention beyond the requirements of current regulatory: such as compliance with damage stability criteria, life rafts installation with enough capacity to guarantee that if the boat lost one the rest covers the total number of persons on board, Radar, AIS, auxiliary generator, bow propeller, motorized closing and opening of the ventilation girds of engine room ... In addition of the traditional systems like the CO2 extinction system on engine room, fire detection system, autonomous emergency engine over main deck with automatic start, sounder, VHF-DSC class A, RBLS, SART, .. The hull has been studied to offer the highest level of safety and comfort to people, with noble and slow reactions, and with studied bow shapes for eliminate the traditional water boarding on deck typical of this kind of catamarans. All of this while maintaining an adequate transversal balance with the sail system to offer the maximum performance while minimizing the corrections with the rudder. . The sailing system has been conceived with the objective of make sailing navigation safe, simple and functional. Use high quality materials, with electric winches for main sail and jib, and heavy weight sails. The mast and boom has been manufactured in anodized aluminium using an oversized section according the boat characteristics in order to ensure maximum safety. The result has been an easy-to-use system, with the minimum elements possible in the passenger area to ensure maximum safety and comfort.